Round Two. 18th June 2016. 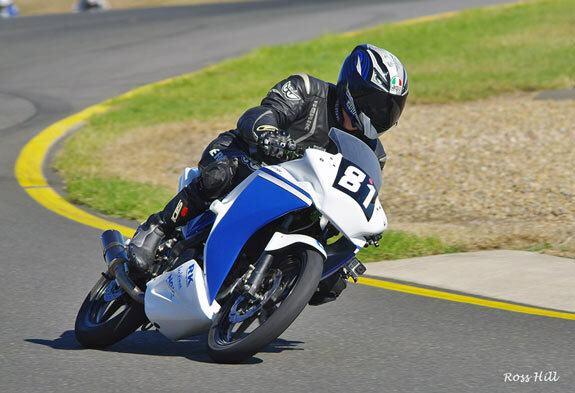 Round two held on the Gardner GP circuit at Sydney Motorsport Park. Weather forecast all week had major storm coming in on Saturday and sure enough it was looking pretty dismal in the morning after a night of torrential rain. 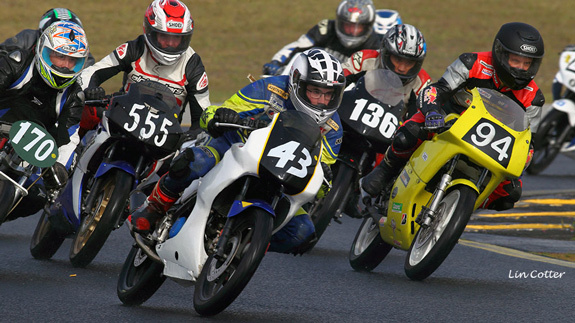 Practice and qualifying for all the classes was run in cold and wet conditions. Amazingly it was starting to clear up as riders gridded up for race one. However four riders went down caught out by the slippery conditions, the race was red flagged which prompted a long delay. When racing resumed it was on a rapidly drying track. After that racing went smoothly. The buckets were the first out for the combined practice and qualifying and unfortunately copped the worst of the wet conditions. #9 Andrew Smith pole setter for the Commuterlite AMs followed by 170 Michael Child gingerly make their way in the slippery conditions. . Practice and qualifying was run in very wet conditions and it was a credit to riders that there was no incidents during practice and qualifying. 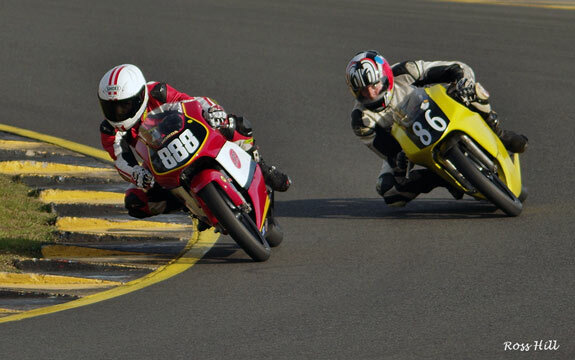 #888 Jack Robinson (Honda RS150CRF) and #86 Anthony Marsden (Honda RS85cr) battled for the win in races two and three. Before the racing had started there was major dramas for #888 Jack Robinson (Honda RS150CRF). A broken gear shifter looked like it was going to put him out for the day but one was eventually located and he was back in business albeit missing qualifying and would have to start from the back of the grid. 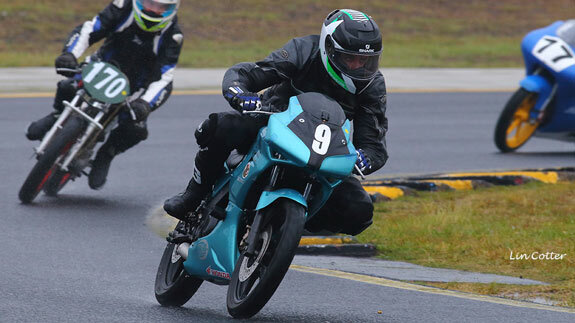 For race one the rain had stopped but the track was slippery and with only one lap completed four riders went down and the race was red flagged. There was quite a delay before racing resumed and in the meantime the track was rapidly drying out. When racing resumed #60 Jason Dunn (Honda RS85cr) and #86 Anthony Marsden (Honda RS85cr) were neck and neck on lap one with Anthony grabbing the lead briefly at turn five but it was short lived and Jason was back in the lead which he held until the end. Meanwhile #888 Jack Robinson (Honda RS150CRF) having started from the back of the grid incredibly had worked his way up to third, posting fastest lap of the race but Jason and Anthony were out of reach. Dramas for three Motolite riders. In the sighting lap current Motolite champion #60 Jason Dunn found a box full of neutrals as he changed down for the hairpin and low sided the RS The resulting damage was to put him out for the day. #29 Harrison Wells (Moriwaki MH80) didn't make it around to the start line as his engine coughed to a halt and #13 Andrew Martin (Moriwaki MH85) retired with front brake problems. When the start lights went out it was #888 Jack Robinson (Honda RS150CRF) who got the holeshot with #86 Anthony Marsden (Honda RS85cr) getting a nose in front around turn two but the 888 four stroke thundered into the lead up the hill from turn five and was never headed on the run to the chequered flag Anthony was riding the wheels off of his RS85 in the twisty bits but didnt seem to have the pace in the long Eastern Creek straight. In races two and three #17 Adam Cameron and #81 Robert Tisdell were seldom further apart than this swapping places many times. 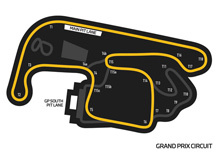 Due to the earlier delays race three was shortened to three laps of the GP circuit. #888 Jack Robinson made a perfect start and was never headed on his way to a flag to flag win. #86 Anthony Marsden once again finished a close 2nd vowing to find more bike speed for the next event. #94 John Olip (Moriwaki MH80R) once again finished 3rd. to finish 3rd overall. #77 Chris Jones had been improving all day and came in 4th with the battling duo of #17 Adam Cameron and #81 Robert Tisdell a close 5th and 6th. They were followed home by Brodie Thackery (7th) and #170 Michael Child retired with a mechanical malady. 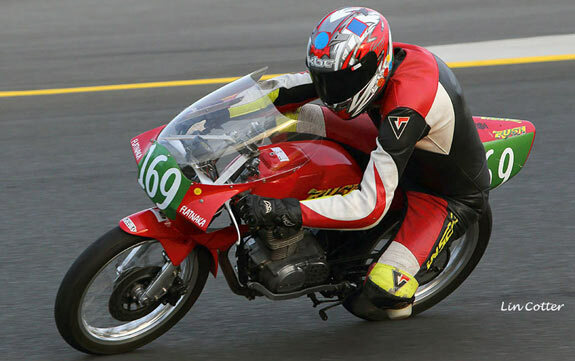 The 2015 champion #169 Ian Gregory (Honda CB150) got his first wins of the year and closed to within 10 points of current leader #65 Tim Smith (Honda CB150). Junior Murphy was missing due to illness and #2 Ken Lindsay (KLR Honda RCB150) moves into third in this years championship. 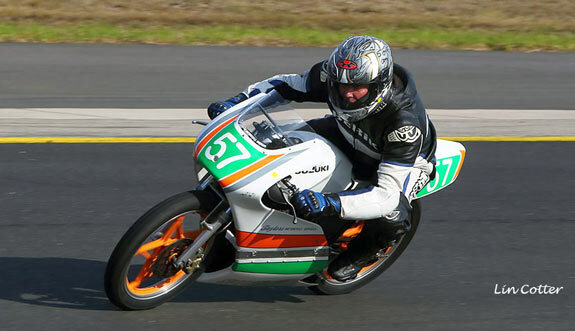 Above: Ian on his Honda CB150 had two wins and a second to win overall on the day. #2 Ken Lindsay leads #8 Kurt Wagus, #65 Tim Smith and #81 Luke rhodes. 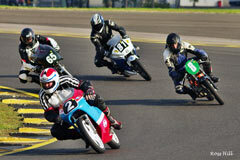 #169 Ian Gregory (Honda CB150) got a great start but had #8 Kurt Wagus (BBE Honda CB150) looking very racy on his tail. The championship leader #65 Tim Smith (Honda CB150) was in trouble with a engine that wouldn't rev out, no doubt due to the wet conditions. #56 Hermann Wagus (Honda150) and #2 Ken Lindsay (KLR Honda RCB150) were also in trouble, well off of the pace but they all managed to limp home and score valuable points. As the race progressed #8 Kurt Wagus closed right up on #169 Ian Gregory and looked like he had the speed to slipstream into the lead before the finish line as he has done in the past. However when they appeared out of the last corner on the final lap Kurt had lost a lot of ground and admitted afterwards "I just stuffed up"
Some feverish work in the pits between the races got everyone up to speed for races two and three. The finishing order was #169 Ian Gregory, #8 Kurt Wagus, #56 Hermann Wagus, #2 Ken Lindsay and #56 Tim Smith. By the time race two came around the track had mostly dried. With his bike now up to speed but starting from the back of the grid #65 Tim Smith made haste to be 3rd first time around, he was 2nd by lap two and led to the chequered flag but only just as Ian Gregory just missed out by four hundredths of a second on an almost perfectly timed slipstream to the chequered flag. King Kenny was 3rd and Herman Wagus fourth. 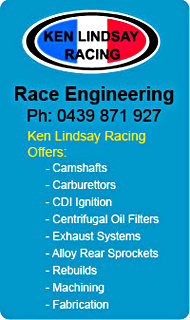 Kurt Wagus retired with fuel feed problems. 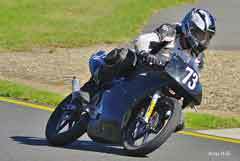 #65 Tim Smith (Honda CB150) made a perfect start and led first time around. However on lap two #169 Ian Gregory slipped into the lead and there he stayed to the chequered flag. Tims challenge was blunted after just catching a big slide on the last remaining wet patch on the track. Kurt Wagus, Ken Lindsay and Hermann Wagus were in a tight battle for the final podium position with Kurt just getting it. Hermann retired on lap two with a rough sounding engine. The hard charging #57 Stuart Ellis Suzuki 150 Won the day with 3 wins, scoring maximum points. Number 57 Stuart Ellis Suzuki 150 continued on his winning ways to score maximum points increasing his lead in the Superlite AM championship . #164 Darrell Francis Suzuki150 finished 2nd in races one and three with #666 Brett Perrington Kawasaki 100 finishing 2nd. in race two. Brett failed to finish races one and three. 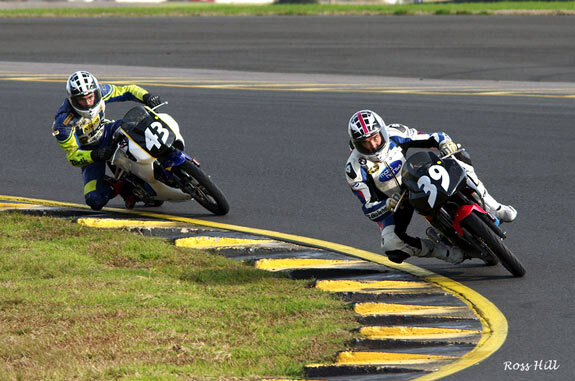 #39 Ken Watson (Honda CBR125) and #43 Keo Watson (Honda CB150) finished 1st and 2nd in the Commuterlite PRO class. The Watson family #39 Ken Watson Honda CBR125 and #43 Keo Watson (Honda CB150) shared the first and second place spoils between them with Ken scoring two wins and a second to run out winner for the day. 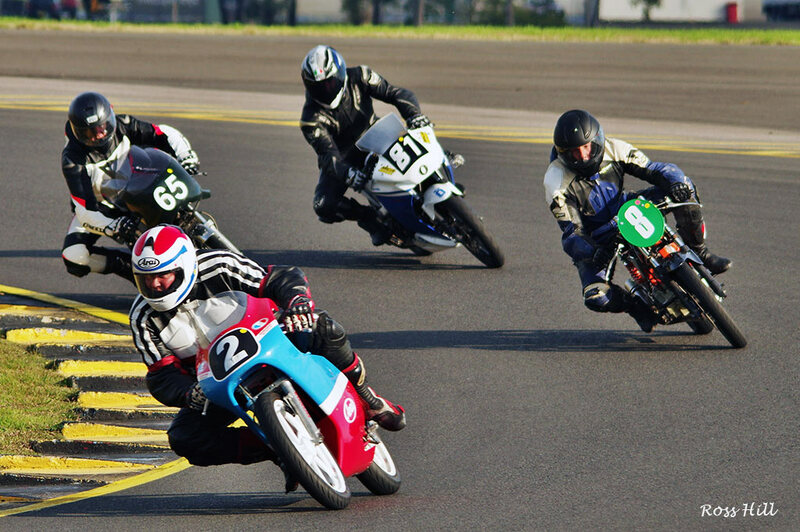 Keo was 2nd with 2015 champion #555 Nicholas Miller (Honda CBR125) 3rd and #4 Martin Kraaymaat (Yamaha YFZR125) 4th. A few riders were missing from the line up due to damaged bikes and bodies after the earlier red flagged race. Number 81 Luke Rhodes on his way to two wins and a second in Commuterlite AMs. 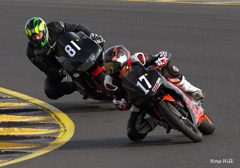 #81Luke Rhodes (Honda CBR125) won two out of the three races but having to give best to a rapidly improving #19 Jan Martizano (CBR125) who pipped Luke on the finish line by three hundredth's of a second in race three. This was Jan's maiden race win and with a 2nd and a 3rd in the other races he got second overall. Number 7 Brodie Frewin (Honda CBR125) another fast improver finished 3rd overall with 2nd, 3rd and 4th. in the three races. #66 Andy Lewer (CBR125) came 4th overall with two 4ths and a 3rd after some hectic dicing with Brodie Frewin, Jan Martizano and #5 Michael lemon (Honda CBR125) Michael looked like he was in for a good haul of points with a 5th in race one and 7th on race two but a DNF in race three dropped him well down on the overall positions to tenth. Number #78 Mark O'Toole (Honda CBR125) finished 6th on the first race and 5th in races two and three to finish fifth overall. 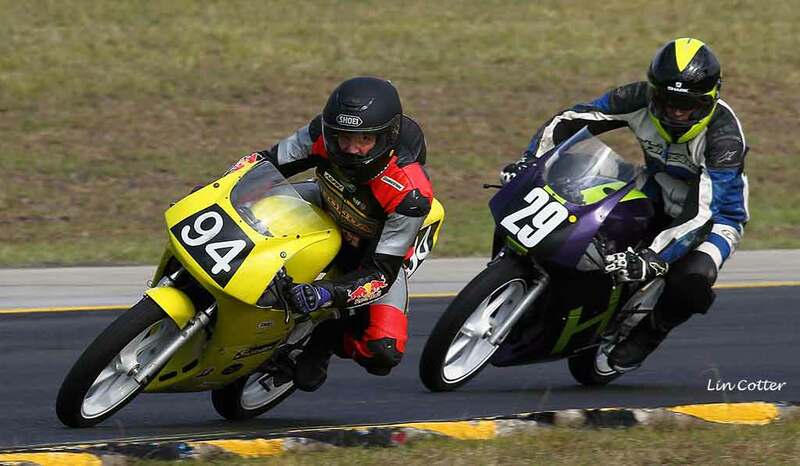 Newcomers #128 Eddie Poucher (Honda CBR125) and #49 Jack Vignes (Honda CBR125) diced throughout the three races with Eddie finishing ahead on races one and two but Jack turned the tables on race three..
Race One, lap one, turn two, Motolites, Superlites, and Commuterlites tip toeing around the hairpin in the wet conditions.